When Apple announced its devices would use random MAC addresses when searching for Wi-Fi networks, it received extensive media attention. And rightly so. It prevents companies from tracking your movements, and Apple was the first major player to start doing this. Windows and Android are quietly trying to catch up. As a result, some devices running Windows now support MAC address randomization, and we will discuss how it's implemented, and where it fails. This information is a small selection from the recent paper Why MAC Address Randomization is not Enough: An Analysis of Wi-Fi Network Discovery Mechanisms. Update: we have contacted Microsoft, and they are in the process of addressing the vulnerabilities we discovered. As you can see, I have it enabled on my laptop. So far it's been working quite well. What's very interesting about Microsoft's approach is that it also uses random MAC addresses when connecting to a wireless networks. In contrast, Apple only uses random addresses when searching for nearby networks, and it falls back to its original address when connecting to a network. In this aspect Windows 10 offers better privacy than Apple. Using a random MAC address to connect to a network can cause problems if users are authenticated (i.e., recognized) based on their MAC address . Interestingly, Windows avoids this issue by always using the same random address every time it connect to a specific network. For example, let's say you want to pay for Wi-Fi access, and they authenticate you based on your MAC address. Then this is not a problem. The first time you connect, Windows will generate a random MAC address. And if you reconnect to this network at a later point in time, Windows will reuse the previously generated address. Therefore the system can still recognize you, and you don't have to pay twice. There's one downside to this approach: since you always use the same address when connecting to a particular network, an adversary can learn when certain devices connect to specific networks. Nevertheless, compared to the old situation where you'd always use the original MAC address, it improves your privacy. 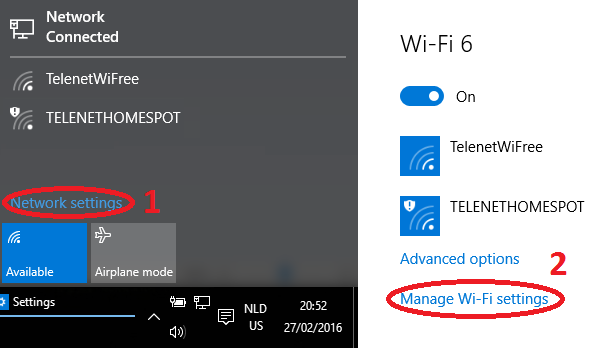 Here SSID is the name of the network you are connecting to, real MAC address the original address of your network interface, and connectionId is a value that changes every time the user removes (and re-adds) the network (i.e., this value is updated if you "forget" the network under Windows 10). The secret parameter is a 256-bit cryptographic random number, generated during system initialization, and kept the same across reboots. Every interface has a different value of the secret parameter, to assure each interface gets different random MAC address. Finally, bits in the most significant byte of address are set so it becomes a locally administered, unicast address. While the presentation by Huitema partly described this process, our paper is the first to describe this formula in full detail. On: the same random MAC address is always used when connecting to this network. Off: the original MAC address is used. Change daily: every day a new random MAC address is used. 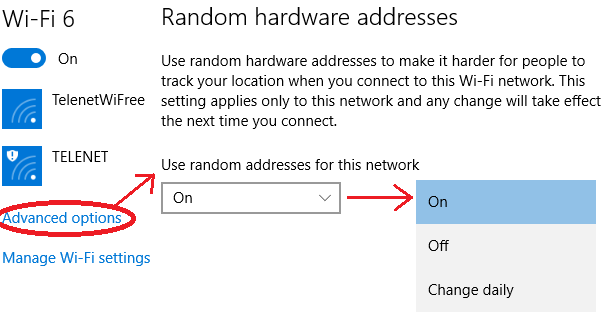 Remark that if randomization is enabled, independent of the above options, Windows 10 will always use random MAC addresses when scanning for nearby networks. This "scanning" address changes every time you connect (and disconnect) from a network, and when you restart your device . Hence it doesn't change that frequently, but it's still sufficient to prevent tracking over extended periods of time. In contrast, Apple changes the scanning address roughly every few minutes, which provides more privacy. Randomization as implemented in Windows 10 significantly improves your privacy. So enable it! Unfortunately, it's not perfect, because there are still some ways to defeat or bypass it. The last frame from ea:69:0a:* has the sequence number of 92, and the other address 7c:5c:f8:* has the sequence number 94. Based on this an adversary can reasonably conclude that both frames are sent by the same device. In other words, he learns that the same device was using both addresses, defeating the purpose of address randomization. 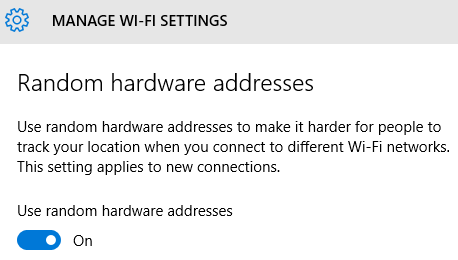 The second problem is that Windows 10 reveals its real MAC address when interacting with Hotspot 2.0 networks. But what's Hotspot 2.0? Simply put, Hotspot 2.0 is a new standard to automatically and securely roam between WiFi networks. No manual interaction is needed. Your device automatically determines whether you have the appropriate credentials (passwords) to connect to a network. Think of this like the cellular network: when you get off the plane, your phone automatically finds and connects to a foreign cellular network. Hotspot 2.0 provides a similar experience for WiFi. In the first probe request it uses the random MAC address 2a:b3:e6:*. These probe requests are used to detect the presence of networks. If there's a Hotspot 2.0 network nearby, Windows will send ANQP requests using the real MAC address, in this case 7c:5c:f8:*. Therefore an attacker can obtain your real MAC address by advertising a Hotspot 2.0 network. Thankfully, Windows 10 only sends ANQP queries if at least one Hotspot 2.0 is configured. Since this standard is not yet widely deployed, few users will have such a network configured . Want to know all flaws that are present in existing implementations of MAC address randomization? And this specifically for Android, Apple, Linux, and Windows? Then read my paper Why MAC Address Randomization is not Enough: An Analysis of Wi-Fi Network Discovery Mechanisms ! It has everything explained in technical detail. Even though authentication based on the MAC address is utterly insecure (an adversary can easily spoof a MAC address), it's still used by many systems.